On Sunday I turn forty nine years young. And I am lucky and happy to say that I feel fine at 49! We went to University of Michigan Health System today to hear the recommendations from the Tumor Board. The surgeon we were seeing was on time for the appointment and was quick to give us the update. The Tumor Board reviewed my case and the recommendation is to receive chemo therapy (surgery is not an options right now). If the chemo is successful in stopping the tumor growth I may be a candidate for surgery in the future. He explained that there were two larger tumors in the liver that are operable; however there are also three additional smaller tumors that are located in different sections of the liver. Unfortunately these other lesions are too small to cleanly remove via surgery. If they were to remove the two larger tumors the smaller lesions might be left to grow / spread and negate the benefit of surgery. He also reported that the PET scan showed uptake in a spot near the 6/1/12 surgery done on the colon. Even though the colonoscopy showed all clear this uptake was outside the colon (e.g. it wouldn’t be visible on the colonoscopy). This would likely require another colon resection in the future assuming the tumor growth can be stopped with the new chemo. I become a candidate for surgery. So far I have encountered a couple different discouraging/frustrating bumps in my battle with cancer. The first was that I went months reporting symptoms to a couple different doctors in the Battle Creek cancer center before a colonoscopy was ordered. Might the colon tumor have been found much earlier if the good Battle Creek doctors had ordered a colonoscopy sooner? Okay, problem fixed – move onto University of Michigan Health System, with more advanced equipment and more experience doctors??? And now we retrospectively look back and know that the numerous CT scans done at U of M showing a normal/healthy liver were actually not accurate. All the while we were thinking the liver was clear there were actually tumors growing. Who knows, it is possible that these tumors were present before beginning chemotherapy. Why did the U of M doctors wait for rising CEA levels to do a MRI on my liver? Given that the liver is at high risk for colorectal cancer metastasis and given that MRIs are more accurate than CT scans in detecting tumors in soft tissue it seems like an MRI should have been done sooner, maybe as part of the pre-screening / baseline testing? If they had done an MRI sooner, perhaps we would have dealt with the tumor surgically and I’d be looking at a different prognosis right now? I don’t raise these points to complain. I don’t believe in could-of/would-of thinking. However, maybe there are some lessons to be learned that might make a difference to someone else in a similar predicament? So what are the lessons? If you have symptoms of cancer make sure the proper tests are done ASAP!!! Persistence may be required!!! Please get it checked out and be persistent! Catching it earlier than later makes a huge difference in the prognosis. GET A COLONOSCOPY if you are 50 or older! Or if you have any symptoms of colon cancer! A colonoscopy is an easy procedure that could prevent a long battle with cancer! Learn about the tests they use to check / monitor cancer. MRI, PET Scan, CT Scan, Chest X Rays… I will be posting this one in more detail on the Cancer Survivor Network as I feel I might have insisted on an MRI of the liver, knowing what I know now! Maybe someone in a similar predicament might benefit from my story! Cancer is certainly a difficult and challenging disease to battle. The physical, emotional, and mental impact is significant! Trying to understand what cancer is and the different cancer treatments can be overwhelming. I pray that a cure for this ugly disease is discovered soon! God bless you all and thank you for your continued prayers and support!!! I know God has a plan, although I don’t know what it is I’m certain it is the best plan for us. But I have to admit that I am hoping a cure is part of the plan and that the cure shows up soon. This is a fun story! I never win anything and winning a car (albeit a used car) is cool! We all get mail from the various car dealerships advertising the sale and guaranteed prizes. Well, if it is convenient I will visit the dealership to see if my key fits the new car or to check my numbers and see which prize I win. I don’t expect to win the grand prize but I’ll take the football or basketball or hat. Well, I received a flyer from Cole Chrysler dealership in Marshall (just down the road from my house) and I stopped in to see which prize I won. As expected I received $5 gift card to Walmart (and was happy for this). The sales person also explained that they were raffling off a mystery used car on Monday night at 7:30pm. He also explained that you had to be present to win! This past Monday was a very snowy day. And when 7pm rolled around I almost didn’t go to the raffle. But then again, it was close and my step daughter Alexis agreed to go with me. And when we arrived we realized that our chances were good – there really were NOT a lot of people there for the drawing. So the drawing time came and I they picked my name! Yah, I won a used car. When we arrived at home and were faced with all the questions about the prize, I realized I didn’t even know the year or mileage on the car. 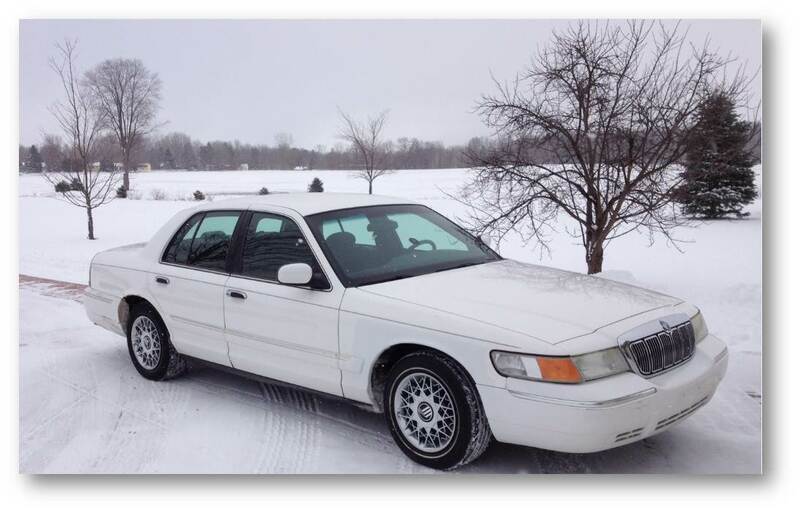 But I did know it was a white Grand Marquis, missing a hub cap, and had a crack in the bumper. You are amazing and generous for helping to educate all of us who may face the same situations you are facing right now. Thank you for sharing your wisdom and kindness. We are so very lucky to have you in our lives. Happy 49th little brother. We will now start bothering the big guns upstairs to help us to find out what our best options are concerning next steps. Signing off with love and admiration and great pride… your big sister. We are praying for you and teh rest of your family. Also, thank you for providing such a nice detailed summary in your blogs. Lastly, nice price! Now maybe Anna or Alexis will have a big enough car to insure their protection as they dive around Marshall! I’ll see you Saturday and I know God is guiding you through this, that’s for sure. And I know He has your very best interests at heart. We are seeing His mighty hand at work in all of this, trust in that, there’s no time to be discouraged or doubting, or straying off His straight and narrow path that He’s laid before you. Every second of every day you know what step God wants you to take, believe in that!!! We’ll be working on the fold out bed Saturday!!! Phil: thanks for the update. It sounds this “bump in the road” can be used to the Lord to help others who are in the same/similar situations. We have discovered in our medical adventures that you must be persistent and proactive. You and your family are in my prayers. Phil — what a well written blog with such good information. My thoughts and prayers are with you and your family as you go through the countless number of tests and treatments. Congrats on the car!